Well, it looks like players will be taking another stab at reanimator decks this standard season. We thought the deck would pretty much be dead with the reprint of Scavenging Ooze, but with Erebos's weapon and Rescue From the Underworld, players may be able to whip up something functional as a top-tier reanimator deck again. Unfortunately, we're still losing some prime targets in rotation (I'm looking at you, Craterhoof Behemoth and Griselbrand). As a blue mage, I'm particularly excited about these - after all, we did prefer something better than Cancel now that Dissipate will be rotating. And don't get me wrong, Syncopate is good. It can just be a tad expensive late game. Dissolve seems like a prime replacement, and will definitely pair well with a cheap draw spell (assuming they decide to print a Think Twice replacement). Swan Song is hard to evaluate at this point, but I'm guessing will be quite potent - I think a lot of it's power will depend on standard (and how players decide to focus on enchantments - gods, their weapons, etc.). Interestingly enough, you could counter your own useless spell to create a blocker if you absolutely had to. Now that's utility! Of this batch, I think I'm most excited about Akroan Horse. Not because it's ultra powerful or will see tons of constructed play, but because it's oozing with flavor. 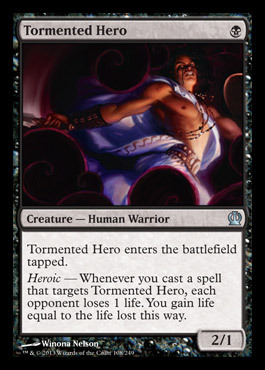 It also seems like a really fun card to play with in multiplayer environments (EDH, anyone?). The rest seem interesting, just not sure they're powerful enough to see constructed play - but we shall see.